The U.S. Food and Drug Administration (FDA) is currently weighing up whether or not to approve the first genetically engineered animal for human consumption. The animal awaiting approval is called the AquAdvantage Salmon. According to Corporate Counsel, how the FDA rules could open the door for a variety of genetically engineered animals to be served up for human consumption. It could stimulate more research in the area and would no doubt raise further concerns among critics of this kind of biotechnology. The designers of the AquAdvantage Salmon maintain that it can grow to market size at double the rate of a normal salmon, in 16 to 28 months, rather than 3 years. The company wants to sell the fish eggs to salmon farmers. The FDA apparently plans to publish an environmental assessment and allow the public 30 days to comment before making a final decision. Critics of the biotechnology involved say that the environmental consequences of farming transgenic fish are unclear and could potentially cause big environmental problems. One scenario is that a genetically engineered salmon could get into the wild and endanger Atlantic salmon by successfully competing with them. The company has said the fish produced will be sterile females and produced only on land-based farms. Unsurprisingly, supporters of this type of biotechnology say there is a need to move quickly to approve the genetically engineered fish in the U.S., as other countries are racing ahead. Recently, scientists in China revealed that they had successfully introduced human genes into dairy cows to create milk with the same properties as human breast milk. Meanwhile, a non-profit environmental law firm, Earthjustice, has submitted a citizen petition to the FDA urging it to withhold final action on the application. The petition is on behalf of a number of organizations including Friends of the Earth, Center for Food Safety, Greenpeace and others. They want a comprehensive environmental statement to be carried out on the potential risks of genetically engineered fish, before any decision is made. 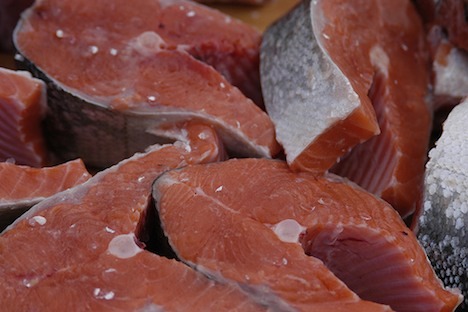 How do you feel about genetically engineered salmon being available in food stores soon? OK, so tell me: what happens if these (or any bioengineered critters) get into the wild, and are so successful out there that they replace the natural ones? Before you leap to answer “the company has said the fish produced will be sterile females” this is massively misleading: a) the company must have breeding stocks! and b) they’re clearly working on the assumption that such an event is so highly improbable that the risk isn’t worth considering (see: Fukushima). I wonder if that is a risk the FDA is factoring in to their decision?